Heads were down after TSS Rovers’ 4-1 dismantling in their season opener against Lane United on Monday night. The Rovers simply weren’t at the races in that one. How they would react after that adversity would give an insight into the team’s mental toughness for the tough PDL season still to come. It would also show TSS head coach Colin Elmes just what this group of players is about and who has the mindset to make it as a pro. It would have been easy to go away and feel sorry for themselves, licking their wounds with their tails between their legs. But that isn’t this group. Everyone at the club felt embarrassed by their lack of fight in Monday’s loss to Lane. They know they’re a far better squad than what that result showed and they wanted to prove it. 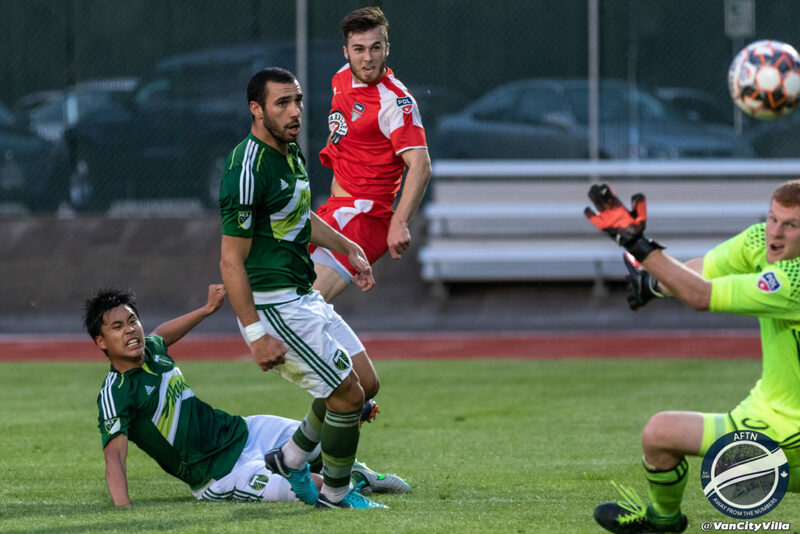 And they did just that against the defending PDL Northwest Division champions, coming from behind to beat a talented Portland Timbers U23 side 3-1 at Swangard Stadium on Friday night, as their hard work at training these past few days reaped its reward. “Willie and I spent a significant amount of time after Monday thinking about how all that rolled,” Elmes told AFTN after the match. “We had a self reflection 20, 30 minutes on Tuesday at training. Everybody kind of talked about some of the stuff that went wrong. And the reaction Elmes got from his players was just what he was looking for. “That was easily our worst performance at home on Monday,” Elmes added. “We’re incredibly happy. The guys did some pretty concentrated stuff in training. Getting back to basics and making sure the other team can’t break us down. Elmes talks about getting back to basics and their pre-match whiteboard kept it simple! 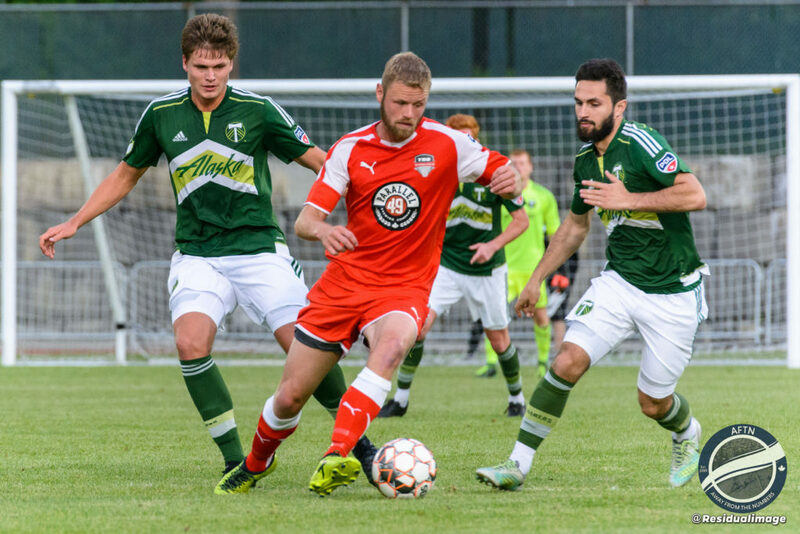 It was a far different looking Rovers side that took to the Swangard pitch against the Timbers, and not just in the form of the five changes to the starting line-up that Elmes made. This was a hungrier looking team. One that kept their shape far better than the previous match and wasn’t overrun in the middle of the park. One that defended to a man, and got the speed of their wingers into the game. One that resembled the team we expected them to be. And they had to do it the hard way. 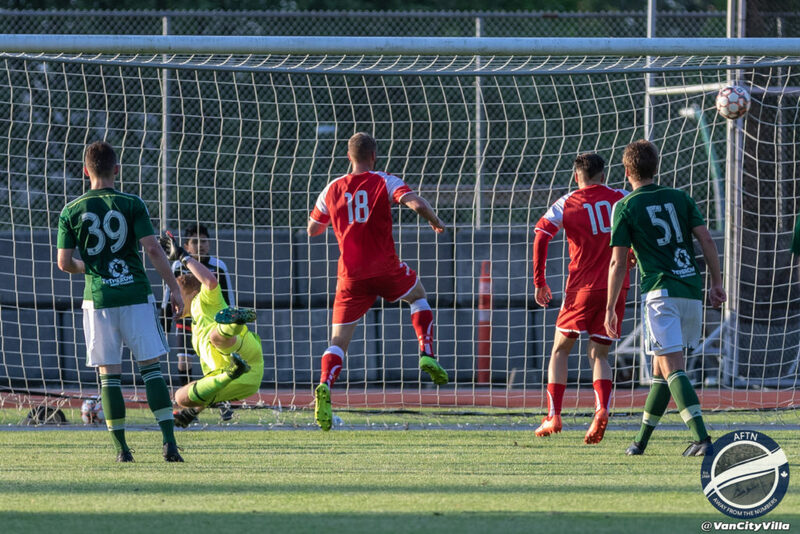 When Malcolm Dixon fired the visitors ahead from the spot in the 22nd minute, after Janko Vong was punished for what looked like simulation in the box from the Timbers player, you feared the floodgates may open again against a free scoring team like Portland. We needn’t have. 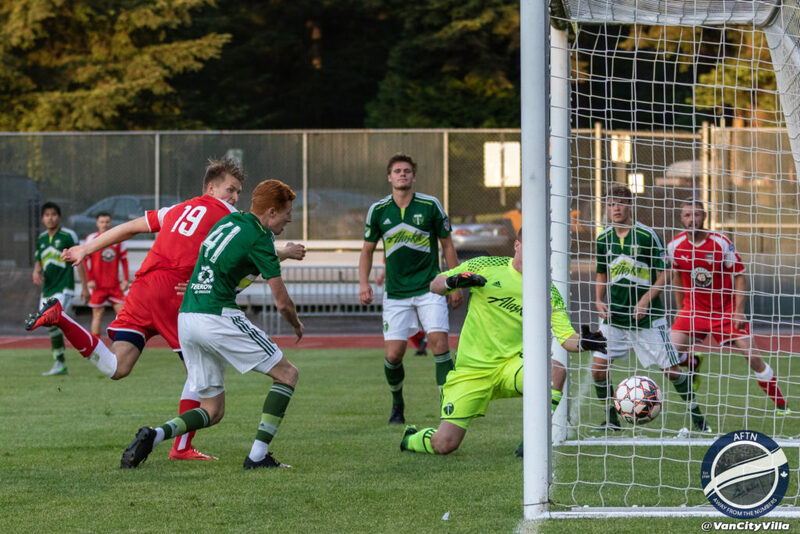 The Timbers were temporarily buoyed by the goal, but the Rovers stormed back to equalise in the 41st minute, when Zachary Nelson couldn’t hold on to a Matteo Polisi shot and new player/coach Nick Soolsma was there to fire home the rebound from a couple of yards out. TSS now had their tails up but time ran out in the first half before they could add another. It was an entertaining first half. Very open and between two teams that like to play attacking football, with the action fast moving. The Rovers carried over their play from the end of the first half and continued their pressure after the restart, getting their reward and the go-ahead goal in the 51st minute. Former WFC2 man Thomas Gardner whipped in a corner towards Soolsma at the near post and the striker showed great control and footwork in the box to take a touch, make room for himself, and cut the ball back to a waiting Danylo Smychenko, who headed home his first PDL goal from a few yards out. Now there was a whole different dynamic to the game. TSS had to hold on to a lead for the majority of the second half and the key was not to let the Timbers restore parity right away. Portland immediately ramped up the pressure, boosted by the strong half time subs they made to their attack. And the Timbers nearly did get back level quickly, but Gio Magana-Rivera’s long range dipper beat Andrew Hicks but crashed off the top of the cross bar. TSS managed to soak up the visitor’s pressure though and went back to controlling the midfield, although Hicks was called upon to make a number of important stops. The next goal was crucial, and it fell to TSS ten minutes from time, finally ending the match as a contest. It was a great solo effort from Edwardson, who had given the Timbers Japanese right back Ryo Shimazaki fits all match, powering into the box, showing a nice stepover, before making room for himself and firing high into the net past Nelson to make it 3-1 and round off the scoring. It was no more than Edwardson deserved. The former University of Portland Pilots forward had done well when he came on as a sub against Lane United on Monday evening. That performance earned him the start against Portland, and with places in the starting line-up very much up for grabs right now, he seized his opportunity with both hands, grabbing that goal, and a second assist, on the night. Edwardson linked up well with Soolsma in particular in the first half, and rekindled a Pilots partnership with Eric De Graaf in the second. He played the full 90 and Elmes was delighted with his contribution. The difference in the overall team performance from Monday to Friday was chalk and cheese. TSS looked far more assured and their midfield trio of Marcello and Matteo Polisi, and Gardner, bossed the middle of the park at times after being invisible for much of Monday’s match. 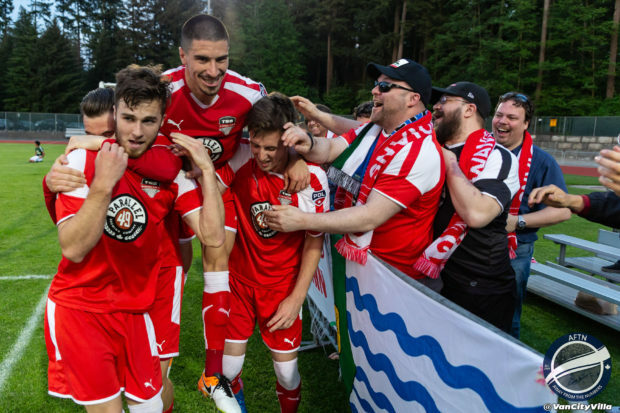 The defence looked a lot more solid and this was an excellent bounce back game for SFU Clan full back Chris Guerreiro and UBC centre back Connor Guilherme, who seldom put a foot wrong. And Hicks was Hicks, pulling off crucial save after crucial save. So what triggered that overall turnaround? The former Toronto FC man was making his Rovers and PDL debut after having to miss Monday’s match due to taking his B coaching licence. The reason Elmes brought the 30-year-old into TSS this summer in a player/coach capacity was clearly evident in the Timbers match. TSS need him to score goals and to be the experienced head on the pitch and in the locker room. You saw his leadership before the match as he got the players together to go over some final plans. You saw his organisation during the game. And you saw his goalscoring threat. 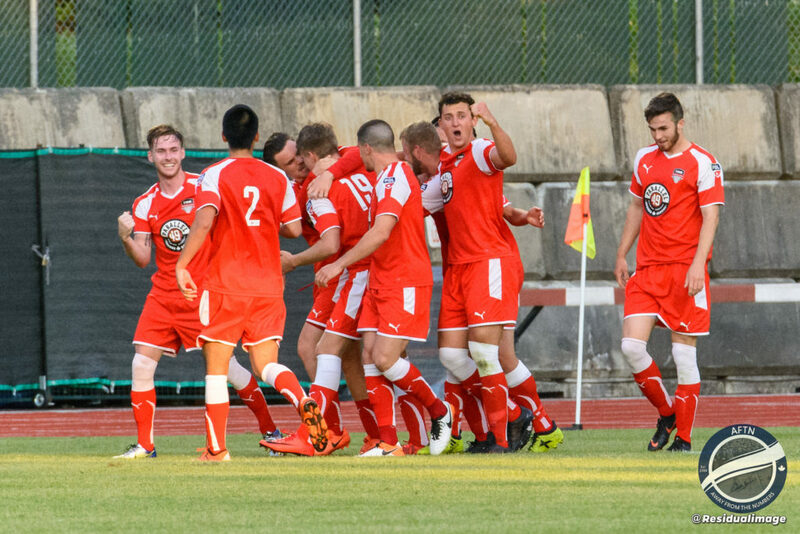 Last night’s win now gives TSS a massive confidence boost as they head out on two tough road trips next weekend, first against Seattle Sounders U23’s on Friday, before heading north to take the ferry to Victoria on Sunday to take on the Highlanders. Certainly a pair of tests for this young TSS team. They didn’t take a point on the road during their inaugural season and that’s something everyone is keen to remedy. If they play like they did against the Timbers they’ll certainly have a chance. But play like they did against Lane, and that’ll be a long ride home.